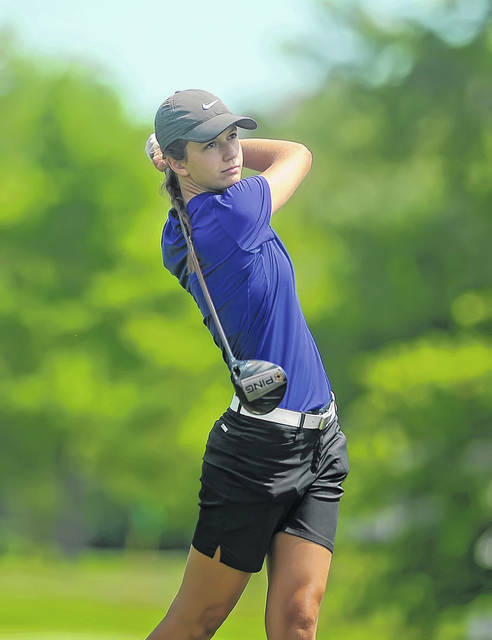 Jill Schmitmeyer won the girls 16-18 division during Thursday’s Lima Junior Golf Association — McDonald’s Series Weisenburger Builders Open at Country Acres Golf Club near Kalida. KALIDA — Jill Schmitmeyer and Kyle Naumann each shot even-par 72s in winning the girls 16-18 and boys 16-18 division of Thursday’s Lima Junior Golf Association — McDonald’s Series Weisenburger Builders Open at Country Acres Golf Club. Gavin Harmon finished second among the 16-18 boys with a 75. Mary Kelly Mulcahy won a playoff against Jaclyn Wojciechowski and Erin Mulcahy for second in the girls 16-18 competition after each shot 79. Ethan Ricketts won a playoff against Carson Harmon for the boys 14-15 title after each shot an 83. In the nine-hole par-36 events, Connor Nartker was the boys 12-13 champ with a 45. Parker Judy topped Brevin Brandt in a playoff for second after each had a 47. Haylee Wurm had the low round among the girls 15 & younger with a 49. Kayla Nartker was second with a 52. The LJGA season is scheduled to finish Monday at Shawnee Country Club. There will also be a awards banquet that evening. For more information go to tinyurl.com/LimaJuniors. OAKVILLE, Ontario — Robert Garrigus made a birdie after a rock saved his ball from water and had a one-stroke lead at 9-under 63 on Thursday when play in the RBC Canadian Open was suspended because of dangerous weather. “Hit it right in the middle of the water, and it hit a rock and bounced over the thing,” Garrigus said about the break on the par-5 13th. The American wasn’t as fortunate on Nos. 10 and 17 at rain-softened Glen Abbey. “Could have been 59 there if a couple putts didn’t lip out,” Garrigus said. GULLANE, Scotland — Tiffany Joh credited her “hot putter” as she shot a career-best 9-under 62 at the Ladies Scottish Open to take a four-shot lead after Thursday’s first round. “I pretty much kept it in play and putted amazing, that’s the only way I could describe it today,” said the 31-year-old American, who opened and finished with birdies for the largest first-round lead on the LPGA Tour this year. ST. ANDREWS, Scotland — American Kirk Triplett and Thaworn Wiratchant of Thailand shot 7-under 65s Thursday to lead the Senior British Open by one stroke after the opening round but both will be keeping a close eye on defending champion Bernhard Langer. While Langer’s 5-under 67 wasn’t the best score over the Old Course, the German’s lofty presence on the leaderboard will have the attention of every other contender. Wiratchant’s round was highlighted by a run of five straight birdies from the third hole. Four more followed, with dropped shots at Nos. 13 and 17. Triplett put his bogey-free score down to following instructions from his caddie, a local man well acquainted with golf’s most famous venue.